Life cycle cost analyses have become valuable tools to the construction industry as a better method of measuring the value of a product over its service life. It has been used successfully by roofing material manufacturers to position more costly but higher valued materials over lower cost less durable systems. The mechanism for life cycle cost analysis is rather simple; merely compute the long term cost of several different products and compare. The numbers include the initial cost as well as associated maintenance and routine costs for upkeep. The numbers are also normalized to their net present value (NPV or PV) to eliminate inflationary and investment effects. Leaking roofs account for untold dollars of damaged internal property, inventory, lost occupancy, business interruption, increased heating and air conditioning costs, and all too often, litigation. Many of these expenses can be avoided if roofs are treated as company assets requiring the same maintenance as elevators, heaters, air conditioners and other mechanical equipment. All of these other assets require routine maintenance. Minor repairs can be made which will prevent or greatly reduce the possibility of major or catastrophic breakdown of the equipment (roof). The technique for conducting a life cycle cost analysis has become formalized through the use of an ASTM method E-917, Standard Practice for Measuring Life-Cycle Costs of Buildings and Building Systems. This mathematical model enables the user to evaluate the life cycle cost of a building (roof) and compare it to alternative designs or practices that satisfy the same functional requirements. Other ASTM methods have been developed to determine the rate of return and pay back for investments and net benefits for investments in buildings. The objective of this article is to compare three scenarios for roof maintenance and management ranging from no inspection or maintenance to a very comprehensive roof asset management program. The building is an industrial research laboratory located in Spring House, PA, a suburb of Philadelphia, at the Rohm and Haas Research Center. The roof is a 37,000 ft² smooth, asphalt surfaced three ply organic felt built-up roof and its size has been rounded off to 100,000 ft² for computational ease. The roof history is actually scenario #3, while scenarios #1 and #2 represent similarly roofed buildings located nearby whose conditions and history were monitored. However, these buildings were not exact replicates to the Scenario #3 building due to differences in occupancy, roof exposure and use. The study period is 20 years. The discount rate is 10% and the escalation rate is 0%. (This is the factor that will influence the increased rise in certain factors such as energy.) The three scenarios consider a number of complex factors including the use of visual and non-destructive moisture surveys, the cost of repairing leaks, interior damage to walls and ceiling tiles, wasted heating and cooling energy caused by wet roof insulation, and saved energy through the use of reflective roof coatings. This scenario assumes no formal roof management or maintenance program. Repairs are made only when the roof leaks. No precautions are made to protect the roof warranty, and the roof will be replaced at the end of 10 years. The initial cost is $3.00 /ft² or $300,000 and the replacement cost is $5.00/ft² or $500,000. We assume total removal of the wet insulation and some deteriorated decking and nailers. No inspections are made of the roof, and leaks are repaired by a roofing contractor at $750 each. We assume no leaks in the first two years (contractor's warranty in effect). From year 3-7 there was one leak/repair per year, two leaks in year 8, three in year 9 and four in year 10. As the roof develops leaks, wet insulation will reduce the "R" value of the insulation. Typically each year 25 ft² of insulation became wet due to damage to the roof. Wet insulation costs $1.88 /ft² in wasted energy. The detailed economic analysis used to derive this datum is below in the Life Cycle Cost Summary. Interior damage as wet ceiling tile and stained and damaged walls has typically cost $500 to repair. This was incurred in years 5, 8, 11, 15 and 18 during the study. This program is a modest maintenance approach. One visual survey is made of the roof each year. A non-destructive moisture survey is made after year 15, prior to recovering and damaged areas are repaired rather than just "patched". Again the initial cost is the same as Scenario #1 at $300,000, but after year 15 the roof is recovered without tear off at $3.25/ft² or $325,000. A formal roof inspection program is implemented for $1,000/ year, and a visual survey is conducted once each year for $1,000. The moisture survey at year 15 costs $5,000. Repairs are made each year from 3-15 and 17-20 costing $250 each. The cost is lower here than in Scenario#1 as the leaks are identified earlier, within the year of their development. Interior damage is repaired at years 7 and 16 for $500 each. Once again, wet insulation causes increases in energy costs of $1.88 /ft²/year with a 5' by 5' area noted in years 3, 5, 7, 9, 11, 13, 15, 18 and 20. This is a comprehensive roof maintenance program. A formalized roof asset management and maintenance program is established costing $1000/ year. Visual inspections are made semiannually and after severe storms. Small roof problems and "suspect areas" are easily repaired with sealant and flashing. Non-destructive moisture surveys are made every five years at a cost of $500 each. In year 10, the roof is coated with a white elastomeric 100% acrylic roof coating costing $0.75 /ft² or $75,000 as a capital cost. The white roof reduces the air conditioning load, but increases the heating load, (black roofs are warmer in the winter) but still saves the building $8,070 the first year. Dirt build up on the roof reduces the savings to 80% or $6460/year. This documentation is based on an Oak Ridge National Laboratory Report entitled "Guide to Estimating Differences in Building Heating and Cooling Energy Due to Changes in Solar Reflectance of a Low Slope Roof". The 20% reduction in reflectivity of white roof coatings due to dirt pickup has been observed experimentally in this study and has also been demonstrated in studies conducted by Lawrence Berkeley Laboratory. No interior repairs are necessary. The data above demonstrates the economic value of a proactive roof maintenance strategy. The last line item "Cost Savings over Approach #1" should easily convince the building owner or facility manager of the value of regular professional roof inspections and the use of maintenance coatings as the economically preferred alternative to tear off and re-roofing every 10 years. While the use of a reflective roof coating in this study only increased the savings by $0.05/ft², the reader is reminded that this study was conducted in the Philadelphia PA area. Actual energy studies as well as mathematical modeling have shown significant energy cost saving benefits in the "sun belt" areas of the country. It is not uncommon to return the cost of the coating in less than 5 years through reduced air conditioning energy use. Scenario #2 enabled the building owner to sustain his original roof for 15 years, before requiring reroofing. However, after the new roof was no longer serviceable, he would be faced with a costly tear off of both roofs. 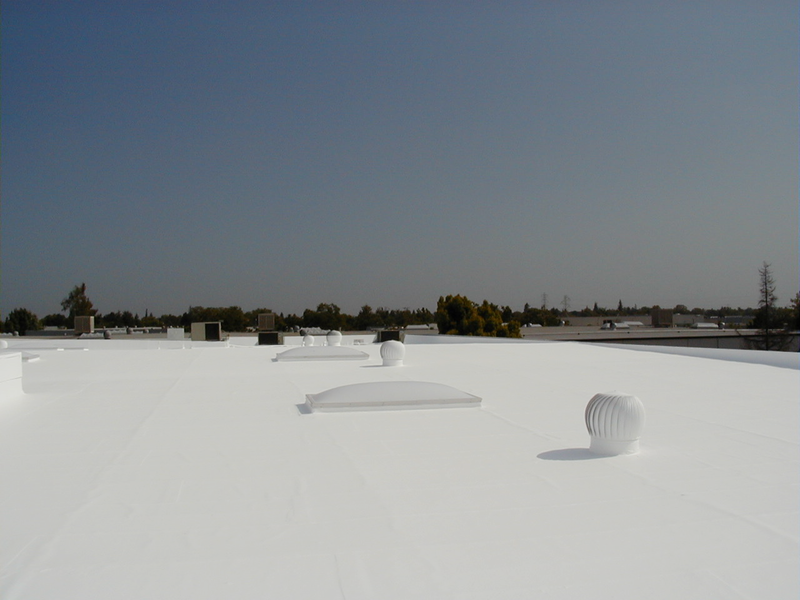 The use of a reflective roof coating in conjunction with a professionally managed roof asset program would possibly allow the roof to be recoated numerous times before replacement of the initial roof membrane. With proper maintenance and coating, a low slope roof can last significantly longer than its predicted life. This will reduce the life cycle cost of the roof and reduce demand for dwindling natural raw materials, precious energy resources and shrinking landfill space. Architects, consultants, design professionals and contractors can truly make "Sustainable Roofing" a reality using acrylic maintenance coatings.